Capital management and risk-adjusted performance are increasingly complex tasks for corporate treasurers, particularly in relation to their banking relationships. Banks have utilized RAROC (risk-adjusted return on capital) for decades, which is a risk-based profitability measurement as a key factor in determining their appetite for business relationships with corporations. Accordingly, you need to monitor your share of wallet as this ensures your banking relationships are competitively priced and meet your changing needs. RAROC helps you gauge how banks will assess your firm’s economic capital and interact with bankers using similar profitability metrics for decision making. This transparency will help keep the balance in your mutually beneficial banking partnerships as products, services and needs evolve. 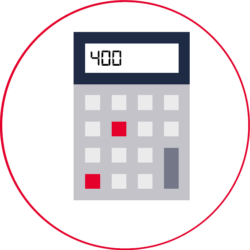 Redbridge uses a proprietary model for clients’ RAROC calculations. These independent calculations help clients gain control over their banking expenses and profitability. Improving your understanding of your bank’s profitability and analyzing your overall banking relationships starts with understanding RAROC and its importance. 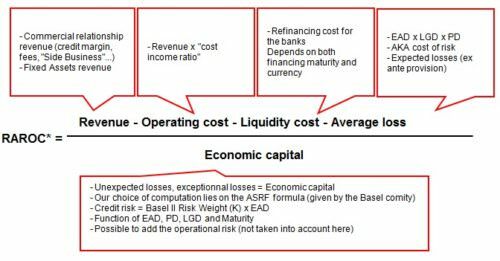 Risk-adjusted return on capital (or RAROC) is a return on capital (ROC) figure, useful in determining the profitability of a business unit or an overall relationship. RAROC’s underlying assumption is that projects or investments with higher risk levels offer higher returns. Much like mutual funds or other investments, it uses risk assessments to determine likely profitability. Banks use it to estimate capital required to absorb losses based on the probability of failure. From a bank’s perspective, investments with greater risk levels must be evaluated differently. So, using RAROC allows for comparisons between cash flows for risky ventures versus those that are less risky. RAROC allows banks to examine your company’s financial performance and establish a stable outlook on profitability across your various business sectors and industries. Developed by Bankers Trust, the RAROC metric grew in popularity through the 1980s as a means of looking at return on capital (ROC). In the 1990s, other banks developed their own RAROC systems and versions of the formula. The banks gave their systems different names, but they all used a metric identical to or fairly similar to RAROC to evaluate their capital allocations and potential business borrowers’ credit risks. The most common alternative to RAROC is RoRWA or Return on Risk-Weighted Asset. These two metrics tend to align under the new Basel III framework. RoRWA is commonly used by banks today to reflect the return on Regulatory capital, whereas RAROC is preferred where projects and investments have higher levels of risk putting more capital at risk. RAROC became an industry standard because of its flexibility. Financial institutions nowadays are often interested in viewing risk across the entire franchise instead of in organizational silos. RAROC provides them, and you, with a tool for examining the performance of your business as a whole, or by specific product lines or business units. This allows companies and banks to better manage their risk and ability to identify businesses or units that realistically could yield the highest possible return, based on the size of the investment and risks assumed. This process is designed to remove volatility arising from risks that can be easily hedged. Funds are allocated based on credit and business risk (volatility arising from operational errors). By tying higher capital costs to riskier divisions, managers are less likely to obscure risks. A McKinsey & Co. study suggests that economic capital is best allocated at a level to weigh distinct contributors of risk, such as subdivision or product line. Accordingly, risks can be better priced where they arise versus being bundled with safer ventures. They suggest computing economic capital from the bottom up to avoid underestimating risks and pricing capital investments appropriately. Your company’s credit rating provides lenders with a framework for assessing its relative credit risk and determining what interest rates to offer. While still used as a starting point and a factor in setting a lending rate, the problems earlier this century reflect the fact that credit rating at the time a loan was obtained did not accurately address risk. Using RAROC now enables your financial institution to calculate the potential (and eventually actual) profitability of each activity, loan or partnership, by comparing them against their consumption of capital. Ideally, this allows them to choose projects that will generate higher profit levels. Like your firm, your bank is out to make a profit. Accurately tracking returns on both sides enables the financial institution and corporation to better control and monitor their banking relationships. RAROC can uncover potential issues, such as unnecessarily high-interest rates or fees, which provides you the information to negotiate better terms in the future. Without using benchmarks like RAROC, companies may believe their bank is providing them with fair pricing based on their ongoing relationship. Do not make that assumption. For companies, it is important to remember that each bank uses a different methodology to quantify credit risk. As a result, there can be considerable differences in the financing terms offered by different banks. Do not hesitate to ask your bank how they determine the credit rating of your company. Banks should be willing to share this information in a transparent way to preserve relationships. This can provide you with an opportunity to negotiate more favorable terms with lenders. Additionally, periodically use your internal sourcing process to request bids from your existing and new banking partners. This exercise could result in major cost savings, whether from your current financial institution wanting to retain the business or from aggressive competition. Banks ultimately want to sell you a financing deal that is advantageous to them. An independent trusted advisor can also assess which bank relationship will ultimately be more profitable for you. Redbridge fulfills this role for clients in a fair, unbiased way. If you have not been using RAROC or its variations, establishing an ongoing practice at different levels of the company will provide a more nuanced view of your operations. It will also ensure you are fully armed and prepared to address your banking relationships. Just be aware that evaluating potential banking partners (and changing banks, if needed) can be a lengthy, difficult process. Redbridge can help guide you through the process and help ensure your banking relationship and expenses going forward are fair and competitive. Contact us to start the conversation.